Vanessa is the COO at Trigger Media Group. In her role, she is responsible for overseeing business operations across Trigger’s portfolio companies, sourcing investment opportunities and managing investor relations. Previously, Vanessa was an Associate Partner at McKinsey & Company. Vanessa received her JD from Harvard Law School and AB in Psychology from Harvard University. If you told me at 21, when I was wrapping up my undergraduate degree in behavioral neuroscience, that I would be a digital media entrepreneur and investor many years later, I would have been really surprised. Back then, I thought I was going to be a researcher, and eventually, an astronaut. But then I slowly realized that 10-15 years could go by without any true impact being made - and I realized I was too impatient for results. My career has taken so many turns since - from the sciences, I went to human rights and international law, then to management consulting and finally to where I am today, building and investing in businesses. I love the thrill of embarking on a new venture, building and motivating a team around it, and shooting for the moon while solving big pain points within an industry. It is still surprising to me that my desire to have tangible results and a lasting impact on the world around me has led me to having a career in business as I had never bothered to read the business section of the news until well after college. I am so excited by the advancements being made in alleviating poverty, eradicating diseases, interplanetary space exploration and in general, the development of new businesses in industries that are poorly served today. I love witnessing new developments happening right in front of us that change our lives for the better. As a mother to two young children, I am terrified about the social inequalities that are being brought on by globalization and automation. As much as I love technology, I know that it will mean deep structural changes that many will be unprepared for - and we need to start thinking of solutions today to create new opportunities and jobs and deal with the psychology of inequity. I am also incredibly scared of the effect being always attached to devices will have on society. I see kids nowadays unable to conduct deep conversations, much less establish eye contact with one another, because they are glued to their phones. Climate change is also keeping me up at night. These issues, taken collectively, make me realize that we may be the first generation leaving our children worse off. And this fear drives me in my work all the time. 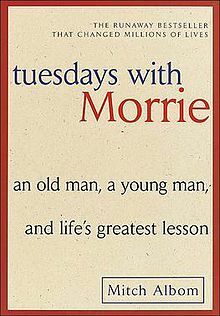 Mitch Albom's Tuesdays with Morrie is simply one of the best books on the meaning of life. We don't have much time on this earth, and the learnings in there are salient. “Devote yourself to loving others, devote yourself to your community around you, and devote yourself to creating something that gives you purpose and meaning.” This is how I try to live my life, everyday. What tool do you use every day that is invaluable? aking 5 minutes each day to be mindful. I take the time to jot down what I'm grateful for and what gives me joy - and what things, activities or relationships I need to weed out because they aren't positive. For me, it means the ability to make positive change and have significant impact. Sounds like a typical day! I am people driven in how I respond to emails. I scroll through to first see if there are pressing things from my family or related to my children. Then I look for emails from my business partner or teams - since those typically need action on my part and they are the cornerstone of what I do. This includes, of course, the InsideHook emails my team publishes - to see that we are living up to our promise to help our readers save time with our content. Then emails from people I know - investors, acquaintances - would come next. Finally, everything else is tackled. I'm still waiting for my husband to organize a meal with his boss, Richard Branson (my husband is on his legal team), so I'd love for you to team up with him! Sir Richard is obviously a brilliant entrepreneur, but it is how he does it that is interesting to me - team first, and purpose driven - and while also innovating in areas I care deeply about, such as space exploration and poverty alleviation. He really is living his life meaningfully, a la Morrie, and that's inspirational.